Little more than diploma mills, FTC says. Just about every high school kid would like to cut class and study at home, which usually translates to sleeping, texting, and gaming. But that doesn’t mean that online “high schools” offer anything of value. In fact, the Federal Trade Commission says two online high schools are little more than diploma mills that mislead consumers into thinking they can get a legitimate diploma or GED for as little as $135. In its federal court complaints, the FTC alleges that the “schools” mislead consumers about their legitimacy, using names like West Madison Falls High School, Columbia Northern High School, Stafford High School, and many others. According to the FTC documents, the “courses” amount to four untimed, unmonitored multiple-choice tests, requiring that students answer 70 percent of each test correctly. The defendants also mislead consumers with statements about membership in accrediting bodies that do not exist and are creations of the defendants themselves, according to the FTC’s complaints. -official collegiate sportswear of scamU!!!! 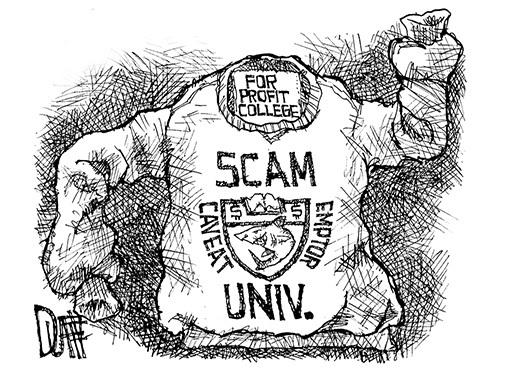 “The problems students have had with some for-profit school are well documented. Remember Corinthian College? You don’t have to have a long memory. In September 2014 the U.S. government sued the for-profit college for what it called an illegal predatory lending scheme. The Consumer Financial Protection Bureau (CFPB) charged that Corinthian lured tens of thousands of students to take out private loans to cover expensive tuition costs by advertising bogus job prospects and career services. To make matters worse, CFPB said Corinthian then used illegal debt collection tactics to strong-arm students into paying back those loans while still in school. Before it declared bankruptcy and closed less than a year later, thousands of students had borrowed huge sums to attend, with nothing to show for it. Now, the Department of Education wants to make sure potential train wrecks like Corinthian cross its radar screen before consumers have been harmed. It has announced creation of a Student Aid Enforcement Unit to respond more quickly and efficiently at the first suggestions of trouble. To head up the unit, Robert Kaye is coming over from the Federal Trade Commission (FTC), where he was a top enforcement attorney. The new unit will have four divisions that will perform special roles. The Investigations Group will be the early warning system, on the lookout for potential misconduct or high-risk activity among higher education institutions so that it can protect federal funding. The Borrower Defense Group will provide legal support, It will analyze claims and make injury determinations. The Administrative Actions And Appeals Service Group will impose administrative actions, such as suspending an institution and levying a fine. It will also try to resolve appeals by program participants. 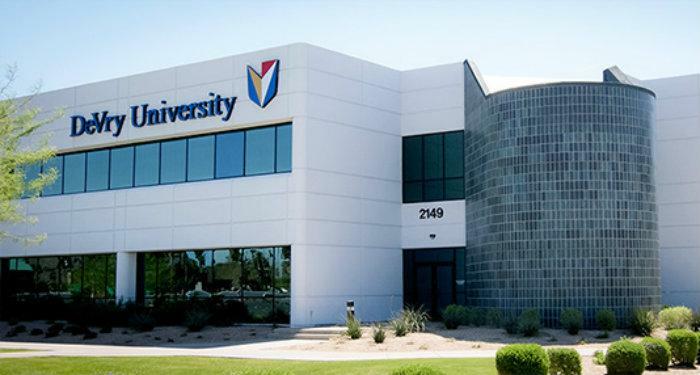 DeVry University is the latest for-profit college to run afoul of regulators. The Federal Trade Commission has sued DeVry, alleging that its advertisements deceived consumers about the likelihood that students would find jobs in their fields of study and would earn more than those graduating with bachelor’s degrees from other colleges or universities. DeVry said it will “vigorously fight” the complaint. In its complaint, the FTC says DeVry claims that 90% of graduates landed jobs in their field within six months — a claim the feds say is deceptive. The suit also alleges DeVry’s claim that its graduates had 15% higher average incomes one year after graduation than the graduates of all other colleges or universities was deceptive. Melanie of Suamico, Wisconsin, recently recounted her experience with DeVry in a ConsumerAffairs review. DeVry says it will “vigorously fight” the charges. “DeVry University measured the employment and earnings results of its graduates in a sound, rational and transparent basis,” the company said in a prepared statement. The FTC’s suit notes that a DeVry television ad showed people in business attire hanging hundreds of “offer letters” on a wall, with a voiceover that said all of the offer letters seen came from just the last year – followed by the 90% claim. The complaint alleges that DeVry counted numerous graduates as working “in their field” when they were not. That might sound familiar to Gary of Wappingers Falls, N.Y., who said that despite getting his degree and going $62,000 in debt, he has been unable to find a job. In a related action, the U.S. Department of Education is also taking action against DeVry for its marketing practices. It is providing notice to DeVry that it will be requiring the institution both to stop certain advertising regarding the post-graduation employment outcomes of its students and to take additional steps to ensure that DeVry can substantiate the truthfulness of its post-graduation employment outcomes.